So I moved from 20 inch fixed harness lines to 22 inch fixed lines. I felt great on 20s, but thought to try 22s. I'm much more sore with 22s. I find myself having to reach out further to hold onto the boom, which feels somewhat awkward, and I'm hanging a little lower now. I raised the boom a little to compensate for longer lines, but it doesn't feel as good as the 20s. Is this something that I will adjust too? Any thoughts? Do I need to remark where these 22s should go on the boom? I'm putting the 22s currently exactly where the 20s went. Is that the issue? as an example victor fernandez uses 33" lines. kook me uses 30" lines and i've got some 32"to try. majority of the kids in my area are on 28"lines. they help with early planing and avoiding catapults. Never worked for me... always find I have to move the lines a couple of cms forward or backward depending on sail size. Also tried 28 and 30 inch lines but found 30 inch way to long. One thing I found that line lengths for the same number printed on the product seem to vary a bit between brands. For example a 24 inch Neil Harness line is equivalent to a 26 inch Severne. In the end I think you need to take Matt Pritchard's recommendation to heart. He once told me always try out something new but in the you need to find what works best for you. Cool someone else asking what i want to know. Im 6'2" On my RBs i use adjustable at 34-36inch length. Nice n comfy with high boom. But on shortboards im using adjustable at 30-32inch seem to get tired forearms???? Think my arms are quite straight. Usually whichever arm is at front tires long before backhand. Maybe this is just a positioning issue for me??? I've always used 32" lines, distance from hand to elbow used to be a guide. I have them a long way apart though. (edit) and a seat harness. It depends on how high your hook is . Im 6'1" and a bit fat so my waist harness sits high .Seat harness will be way longer . As I'm loosing weight the harness is sitting lower and my lines are getting longer.. Started with 26,now 28 but could now go 30 . That's $100 for three sets of lines every 6 kg I loose. Thats nothing compared to the smaller boards I'm thinking about. 22" wow that's short. I get given a hard time for my short lines using 30" with my wave gear!!! Bump boom down a bit. People think that harness line length is a function of harness hook height and of boom height. In fact it's actually more about your sailing stance. Sailing stance is then a function of footstrap position, mast foot placement, and boom height. Hook height makes little difference in this when you sail with a modern stance. For example: If you use too much mast rake and drive your board heavily off the back foot then you have an old-school stance that typically drops the boom too low where you hook in - and that's why you then feel you need shorter lines. With a more upright stance, the mast is more vertical, the front footstrap is probably nearer the mast foot, and the mast foot itself is probably in the centre or rear half of the mast track. The pull on the harness lines is then outwards and less upwards, and harness line length is then a simple function of your arm length. So, even as a short arse, I'm on 30 inch lines. If you are 6 foot then you probably should be on 32s or 34s. I'm not the sort of person who is going to tell anyone else how topsail their gear. But if you want to change harness line length used then think about the stance issues above. A modern upright stance helps you drive the board more off the front foot, and with balanced load over the fin(s). It takes a while to adjust to longer lines, so you need to stick with the change for a while before simply reverting back to what you are used to. Interesting stuff here! So I'm 5'11, 175 pounds. I use an XT seat harness, hook is about the level to my navel and boom hight is about shoulder length high. I did move the boom up a half inch to an inch higher on the 22s. If I move the boom any higher, I won't be able to hook in very well. The boom clamp just clears the tail of the board at this hight. Before with 20s, the boom clamp rested at end of the tail of the board. 30" plus lines seem way too long. I can't even imagine using those. I feel like I'd be water skiing on my back almost. I started with 18" lines when I learned, then moved to 20s. 18" were too small, felt constricted. 20s felt good. 22s feel like I have more breathing room, less constricted, but I'm not used to hanging over the water as far, reaching out to grab the boom seems like more effort. I really depend on the harness lines to take most of the effort off my arms, as the 20" lines did the job. Again, will I get used to the 22" harness line length? These lines seem plenty long to me, but it's funny to me how short they are to you all. I do move my lines forward for smaller sails and back for larger sails. I marked all those settings for my 3 sails. So my 22" lines are Chinook. How do you compare with Victor .. oh you have 2 arms . Good points Basher! My sailing stance is modern. I bump n jump most of the time. The rig is always more upright. Yes move them for different sails of course - it read like you were asking if you have to move the lines for different line lengths which clearly is a no. Don't move the boom up n down to compensate for line length. The boom needs to be a correct height for your height and stance (with very little variation maybe on some days for wind strength but forget that for now). Correct boom height and leave it alone. Shoulder is good. Then go try longer lines. It will feel wrong at first but once you are used to it everything is better trust me. How long will this take to get used to the new set-up? ^^^ One afternoon's sailing should do it. I remember when i went to 30 after using 26, it was a revalation. Errrr Magic, how long is a piece of string????? You are MAGIC RIDE arent you???? Lol!! I've been out 2 sessions with this new setup, a total of 5 hours and I'm still not dialed into it yet. My arms and ankles are so sore the next day. I'm hardly ever sore after sessions. Different angle, different parts of the muscles being used perhaps. I just don't feel quite balanced yet. I will just have to give it more time. I don't get why an upright stance is more modern, seems to me an upright stance keeps the centre of effort forward which makes sense regarding driving more off the front foot as the centre of resistance needs to be in balance so therefore it is more forward as well. But doesn't that increase the wetted surface area of the board. Would just depend on the style of sailing your doing or even the point of sail your on as to whether that is a better stance than raked back and driving off the fin. I should clarify what i said above about bumping the boom down. Bump the boom down a bit, not because of harness line length, but because front hand pressure means your boom is too high for your height and hook height. I had the problem for ages. Being a slow learner, as i progressed, i started bumping my boom up a bit, wanting to give myself that better leverage over the rig. Not miles higher , just a little higher. From there i couldn't comprehend why i forever had front hand pressure. Moving the lines forward only made the problem worse, i thought oh well front hand pressure must be normal. then one day i moved the boom down a bit on a windy day, and the penny dropped. i'll just assume your first language is not english as you seem to not have a good grasp of the conversations happening on seabreeze. i mentioned victor because he is on wave gear with a waist harness. it was intended to head off the idea that only race gear uses long lines. so how about you try not to make another thread about you. making snarky comments does nothing to help anyone other then you. The longer lines may encourage you to have your hands closer together and also with a softer more finger tip grip. All good things I think. Sparky - that's an interesting comment, I tend to have about 1 metre spread between my hands and grip hard. Food for thought!! Im finding with longer lines = straighter arms. Thats when my front arm fatigues earlier. Doesnt affect rear arm at all. More of a slightly bent front arm gives me quicker response n higher strength. Is it the front arm or the forearm grip fatigueing? For me that is just a matter of moving the lines forward on the boom to balance the load. Low aspect slalom sails will also usually rake back more and the boom will come down at a steeper angle, lowering the centre of the boom across your body. Even so. I am a shorty with a seat harness and I use roughly 30 inch lines (adjustable) most of the time. Even in the waves I use the same harness and just shorten the lines an inch or two, and lower the boom slightly. I feel like having straight arms and hanging off the tendons will resulti less muscle fatigue. Probably just me, I'm definitely old school technique. If I have the lines too short, or the boom too high, when I drop off the plane and get out of the straps I find it difficult to unhook. One other thing, short lines don't accidentally hook in as much mid-gybe. Which is very embarrassing.. I guess I look at this the same way i look at sailors of differing abilities and different experience on the water where I sail. Firstly you get those who are still learning and who tend to be terrified of catapulting, so they stand too far back on their boards, and stick their mast foot too far forwards in the mast track - falsely thinking that will 'hold the nose down'. Invariably they need an oversize fin in the back of the board to compensate for all that backfoot weight. Then you get those guys who have been sailing for years and who are often stuck in a stance rut - and it's usually they who have short lines, to match a sailing stance where they rake the mast back and drive the board hard off its tail until it spins out. You can still go fast like that but you don't have much control, and it's not a great stance for gybing either. A more upright stance gives you the freedom to drive the board and to change trim perhaps in response to waves, chop or gusts. The longer lines mean you hold the rig more at arms length and that means you are less likely to choke the rig. An upright stance also means the pull of the lines is more outward and that often means you solve all those issues about waist harnesses riding up. 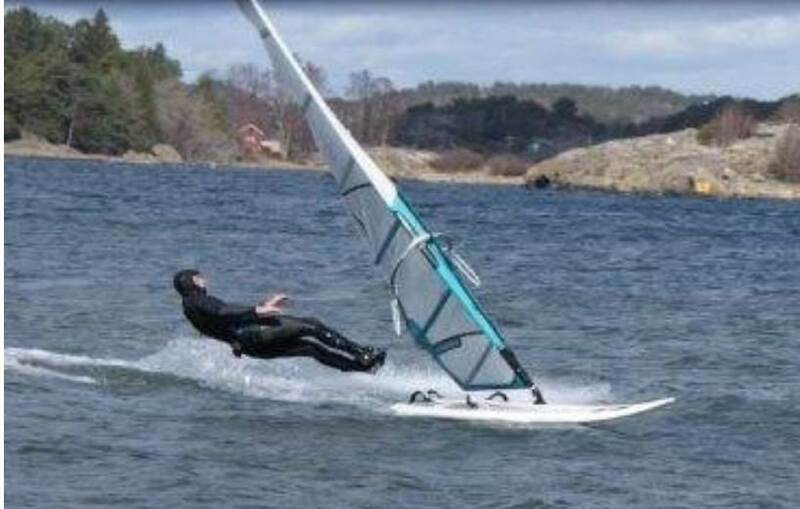 Longer lines work for all types of windsurfing - racing, slalom, speed, waves, and freestyle. For speed, you can still drive the board off the fin and fly the hull off shorter wetted area, and you might find you can use a shorter and faster fin.